Marriners Falls, Apollo Bay – Closed. 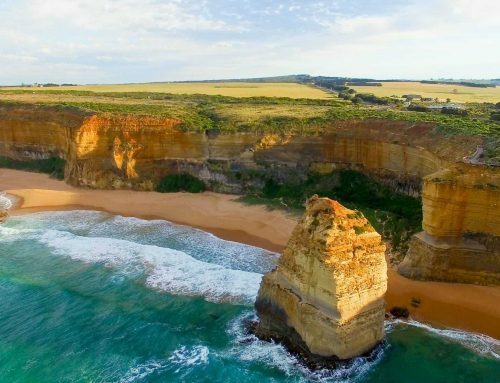 The Great Ocean Road drive is famous for the 12 Apostles but it has so much more to offer. 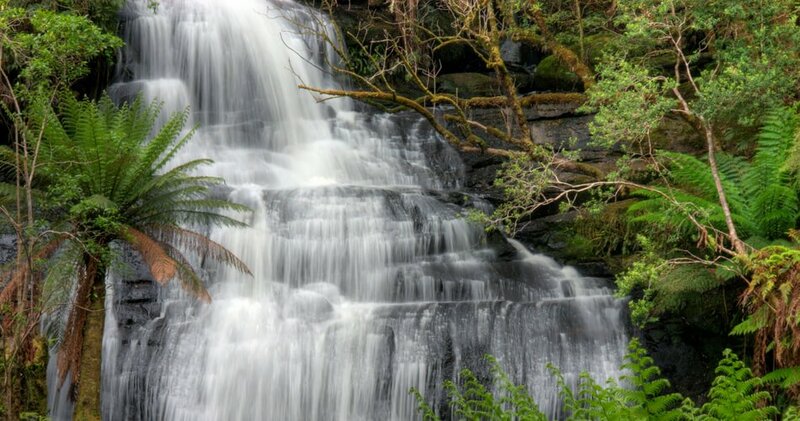 Beautiful waterfalls high in the Great Otway National Park are well worth taking extra time to see when touring the region, these are some of the best waterfalls in Victoria. Most of the falls are very easy to reach and others take a little more effort, bushwalking through the spectacular cool temperate rainforest of the Otways. Erskine Falls near Lorne and Triplet Falls beyond Apollo Bay are the largest and best known out of over 12 waterfalls to visit. 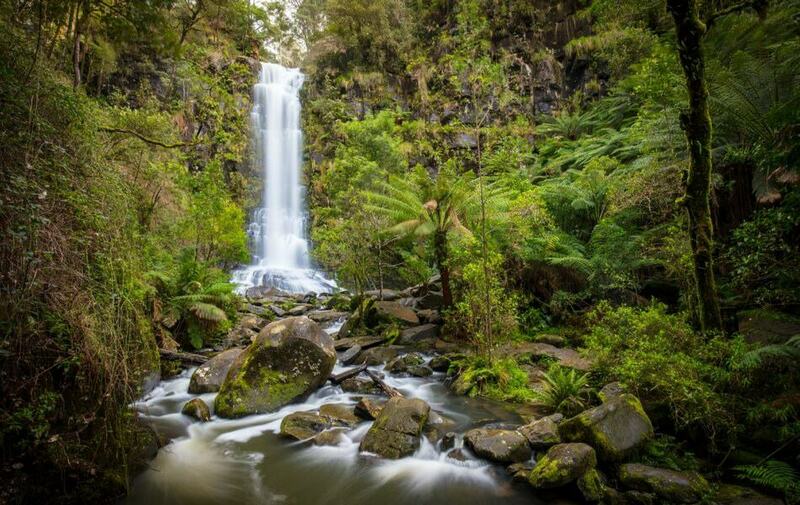 The area around Lorne has beautiful waterfalls and over 60 kms of walking tracks linking together, providing enough hiking to keep visitors here for days or even weeks. 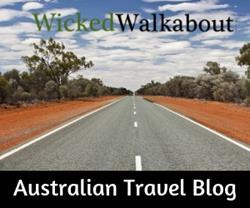 Some of the walks can easily be included in a Great Ocean Road itinerary of 2-days or more. Occasionally a walk may be closed due to track upgrades, fallen trees or it may have been permanently closed for whatever reason – please abide by any signage. If water levels are high, some tracks can become dangerous, take care and do not continue any walk if river levels are high. Visitor Information Centres along the way can provide maps and current information on conditions or closures. 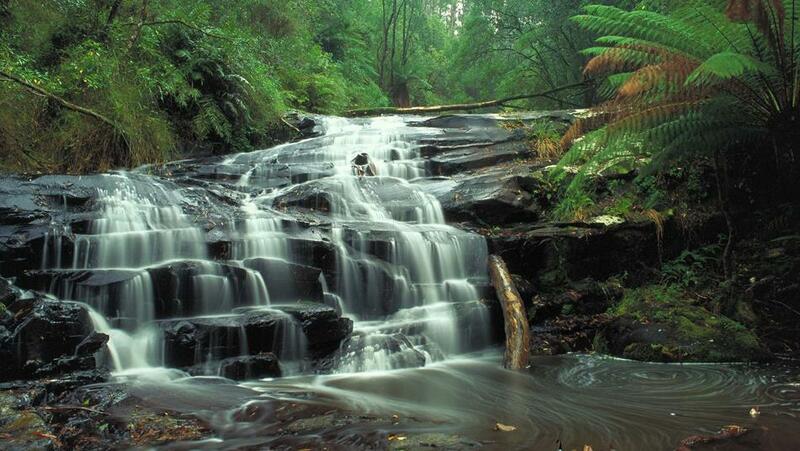 About 10kms drive from Lorne, Erskine Falls is one of the most visited waterfalls in the area. From the car park, over 222 steps lead down to the viewing areas. The first viewing platform, from above the falls, is pretty but following the steps down the steep track provides the best vantage point to see the falls. Get there by following the Erskine Falls Road out of Lorne, signage is clear. Lemonade Creek Cottages is the closest accommodation to Erskine Falls and a great walking track to the falls starts nearby (about 4 kms each way). The cottages are quite rustic and set on a lovely property. Dropping about 30 metres, the falls can also be approached by following a beautiful bushwalking track from the township of Lorne. 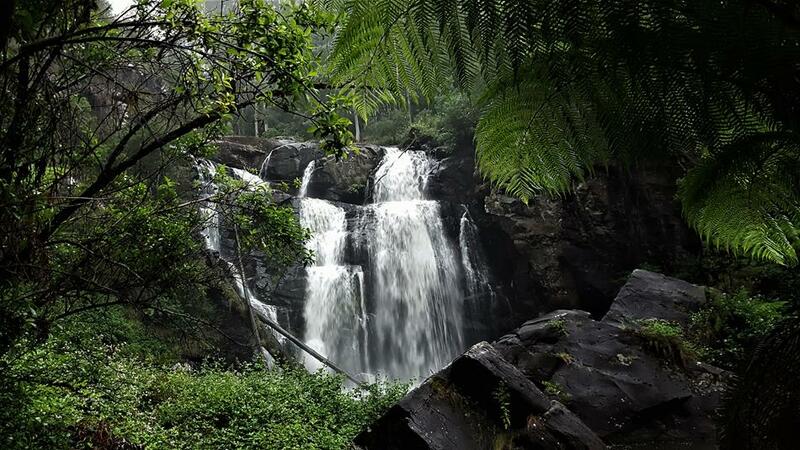 It is 7.5 kms each way and passes by two more waterfalls – Straw Falls and Splitter Falls. Get Directions to the Start of the Walk to Erskine Falls from Lorne, read more about the walk here. The drive from Melbourne to Lorne can be done as a day trip, an overnight stay in Lorne (or longer) is recommended if planning to do this beautiful waterfall walk. 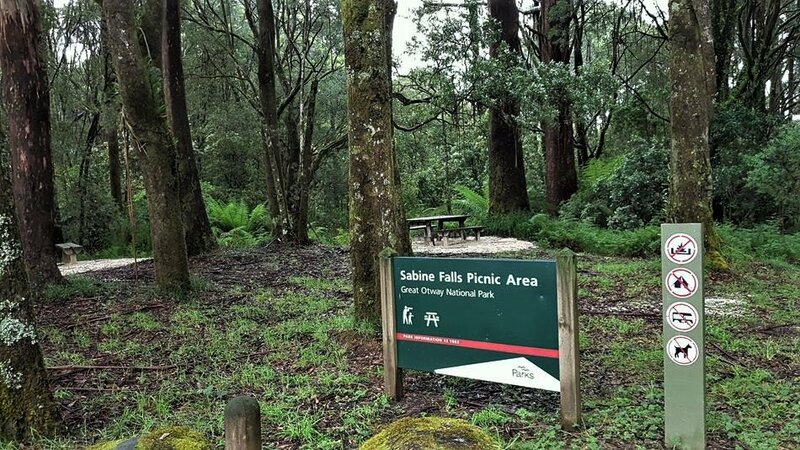 From the Blanket Leaf Picnic Ground which is off the Erskine Falls Road near Lorne, the walk is 2.2 kms/1.5 hours. 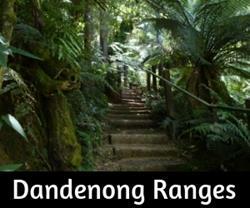 It is a reasonably strenuous walk but rewarded with the pretty cascades and surrounding forest. 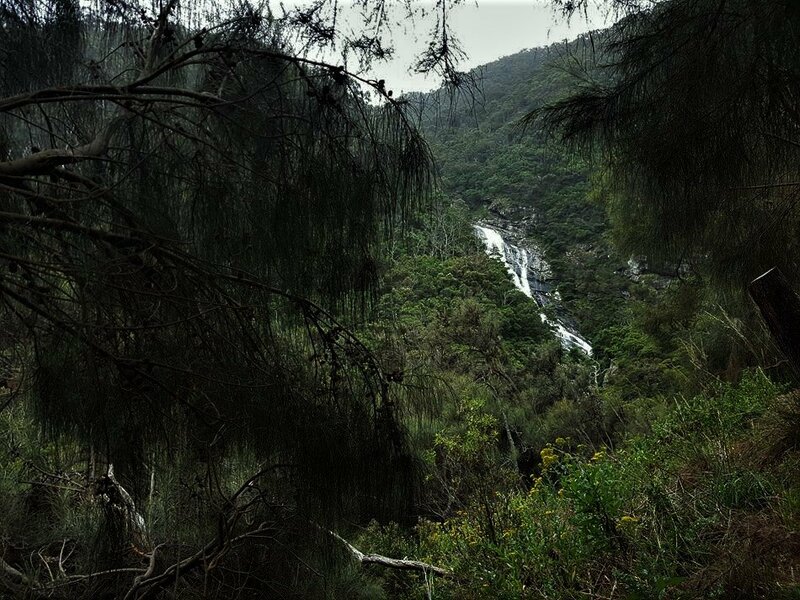 Another pretty waterfall close to Lorne. About half the height of Erskine Falls, but well worth the walk. Starting from the Allenvale Road carpark and following St Georges River, the walk only takes about 1.5 hours return and covers 3.5 kms. Signage is clearly marked from the car park. There is a free camping area at the Allenvale Mill area which is close to the start of the Phantom Falls Walk. Limited sites on a first come basis with no reservations. This is a walk-in camping area, a short walk to the campground of about 200 meters. Read more about the Allenvale Mill free camping area. The pretty Kalimna waterfalls have two sections, lower and upper. 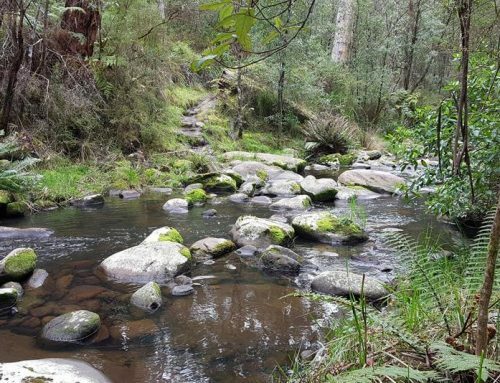 Won Wondah and Henderson Falls are also popular and they can each be accessed from the Sheoak picnic area (different to the Sheoak Falls carpark). It is quite an easy 3km hike on well sign-posted tracks, though can get a bit muddy in winter. If Garvey Track (beyond Sheoak picnic area) is open, it is possible to drive a bit further and do the shorter walk to the Kalimna falls. 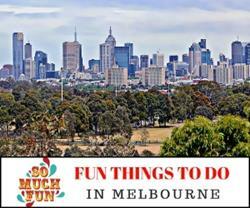 Get Directions to the Sheok Picnic Area and Waterfall walks. A 6 km/2.5 hour walk to the Cumberland Falls is well signposted and very popular. The Cumberland Gorge has a couple of good lookout points that can be hiked to as well as the walk to the falls. Opposite the holiday park is a good beach, making this one of the most popular camping parks in the area. Cabins at the holiday park are an ideal base for doing many walks in the area. Access to the falls walk is via the car park at the Cumberland River Holiday Park, 7 kms west of Lorne. 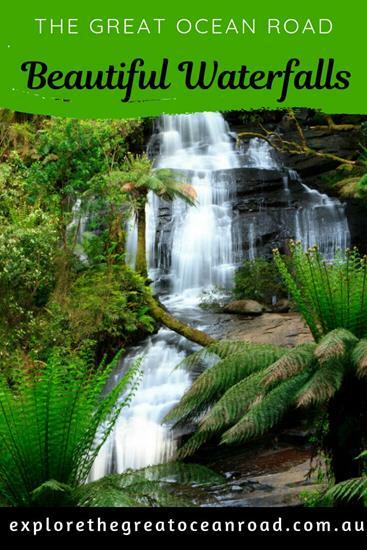 Get Directions to the start of Cumberland Falls Walk plus other bushwalking tracks and the Cumberland Holiday Park. From the car park off the Great Ocean Road (a few kms from Lorne), the walk to Sheoak Falls is only 2.2 km return and best viewed after rains and in the winter months. Swallows can often be seen nesting in nearby ‘Swallow Cave’ during Springtime. The falls flow down the rocks and may not be the most spectacular in the Otways, but are still worthy of a visit, especially as the car parking is so easily accessible. Views to the ocean are beautiful and the walk can be extended to ‘Castle Rock’ – 7km / 2 hours return. Carisbrook Falls tumble down the rock face and it is a good walk to the falls beneath lovely Sheoak trees. 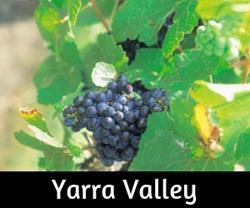 It is a 20-minute walk, reasonably steep in parts and accessed from the Great Ocean Road, 12 kms east of Apollo Bay. Nearby Kennett river is the perfect place to spot Koalas in the wild. The waterfalls located in the Apollo Bay area are not within an easy walking distance as they are all located well beyond the town, high up in the Otways. A day drive, or even two days, to take in the beautiful waterfalls as well the Redwood Forest is recommended. Two days will be needed if you plan to visit all the waterfalls, and it is worth doing as each waterfall has its own special beauty and the walks in are all stunning. Perhaps camp, the basic free camps in the area are fabulous or stay in a B&B in one of the tiny townships such as Forrest where there is a microbrewery, bike trail, great food, and unique accommodation. These falls are quite high in the Otway Ranges and definitely worth the drive to see, not massive but very pretty. The roads around this area cross over the Otways and require a bit of driving on unsealed sections. It’s one of my favourite waterfalls. The walk to the falls is reasonably easy, taking about 1.5 hours / 2.5 km return. The track is really pretty with deep moss covering many of the trees. There is a free camping area at the falls car park with space for a number of tents or campervans can stay overnight in the car park. The area is Dog-friendly, even the walk to the falls. 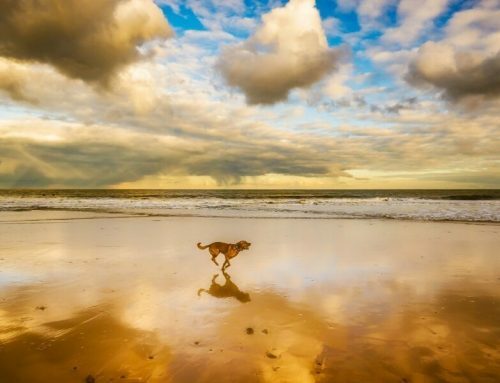 It is not recommended to walk dogs all the way, though, as some sections of the track are difficult to navigate with open steps that dogs can’t walk on easily. The drive along Binns Road to the Hopetoun Falls is unsealed and feels quite remote. The track to the falls is only 20 metres to a viewing platform and 1 km to the lower viewing area. 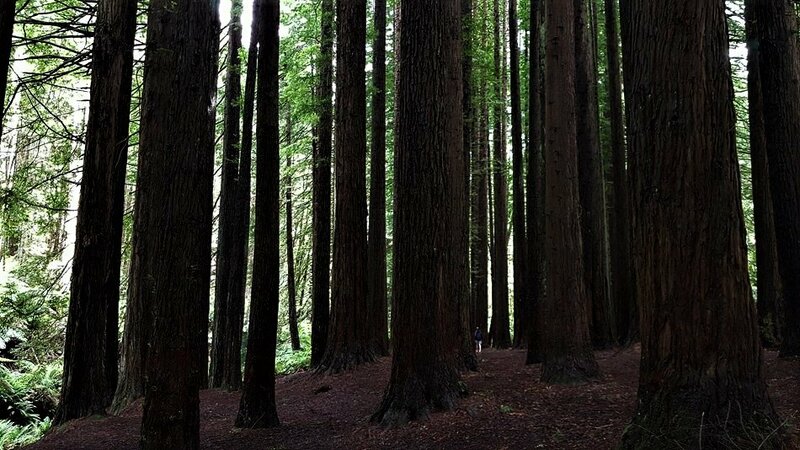 Nearby, the Californian Redwood Forest is well worth visiting too. Planted in 1936 the ‘Sequoia Sempervirens’ is quite an unexpected sight. Binns Road runs from the Beech Forest-Lavers Hill Road all the way down to the Great Ocean Road, not far from Apollo Bay. Both Beauchamp and Hopetoun Falls, as well as the Redwood Forest, are on Binns Road. Definitely one of the prettiest falls in the Otways with a gorgeous walking track that has been upgraded and is suitable at any time of the year. The walk through mountain ash and myrtle beech forest is superb, 2kms return / 1 hour. A few relics from the past logging days can be seen and signage explains the work that went on in this area. Access is via Phillips Track off the Beech Forest Lavers Hill Road, passing the Otway Fly Treetops Walk on the way. Get Directions to Triplet Falls Car park. Little Aire Falls walking track passes through Mountain Ash and cool temperate rainforests before coming to a fabulous cantilevered platform with super views over the waterfalls. There is a fairly steep climb back to the carpark. The walk is 2.5km /2.5 hours return and is reasonably strenuous. 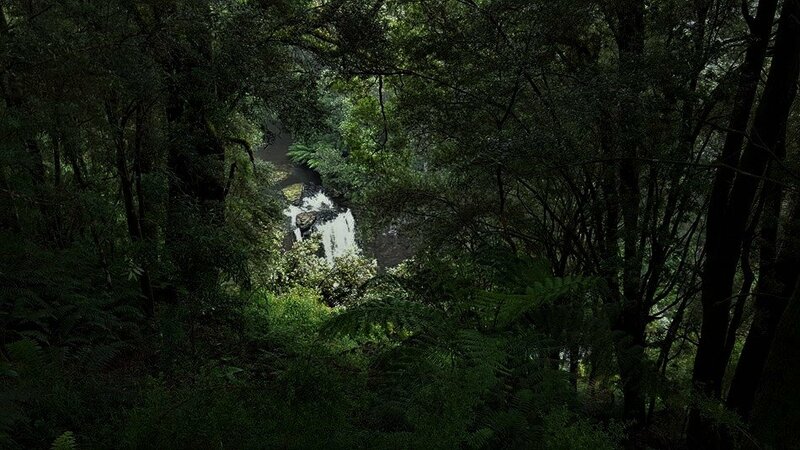 The falls walk starts from the Triplet Falls carpark on Phillips Track, off the Beech Forest – Lavers Hill Road. Excellent signage makes it easy to follow the trails. Such a shame these falls are now closed as it was quite an adventure to get to them years ago. Whether they will re-open, we do not know. The highest waterfall in the Otways, the Sabine Falls bushwalk takes 2 hours return from a picnic area off Sunnyside Road. They are not the best-known falls and do not get the numbers of visitors that some waterfalls attract, but are worth adding to a ‘waterfalls bucket list’. The walk is quite strenuous with some steep sections. Access is from Sunnyside Road which leads off the Ocean Road or via Forrest-Apollo Bay Road. Stevensons Falls is a popular hike in the Otways and one of the best waterfalls, especially after heavy rains. From the car park, it is only a 500-meter walk to the falls. or from the nearby campground, the hike is 4.6 kms / 1.5 hours. Access is from the Colac-Skenes Creek Road near Barramunga. There is a free campground near the falls with basic facilities and about 50 un-powered campsites – the area can become very muddy after heavy rains. It is on a first come basis and does get crowded at peak times. Dogs are permitted in this campground.